Search and rescue? Society is only obsessed with discovering new species, not preserving them. Society is obsessed with discovering new and rare species. Preserving them? Not so much. We hear a lot about the newly discovered olinguto, pictured, because it’s cute. But the Tasmanian devil, which isn’t so cute, and isn’t so new, doesn’t get nearly as much press, despite being threatened by a facial tumor disease. We’ve been to the moon and been just about everywhere on Earth. So what’s left to discover? In September, Future Tense is publishing a series of articles in response to the question “Is exploration dead?” Read more about modern-day exploration of the sea, space, land, and more unexpected areas. This August scientists at the Smithsonian unveiled the discovery of a new species—kind of. The olinguito had been hiding under our noses for decades, universally mistaken for its cousin the olingo until DNA testing proved the red-brown critter to be an independent species. 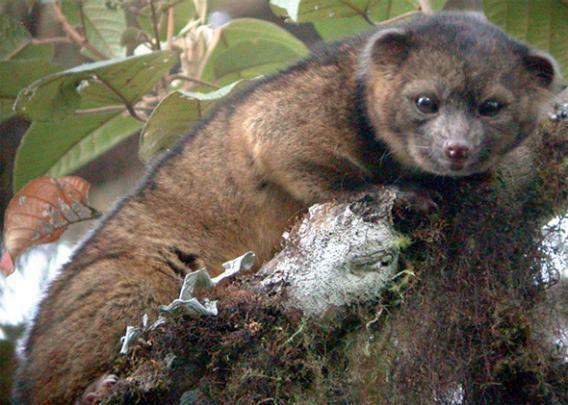 Little mentioned in all the excitement was an alarming fact: Though the olinguito is not yet officially endangered, 42 percent of its habitat has already been destroyed by humans, and its numbers are likely to dwindle further. But don’t expect to hear much publicity about the olinguito’s decline. Every year, scientists discover thousands of new species—about 20,000 in 2011 and 18,000 in 2012—and occasionally they even rediscover a species thought to be extinct. Then the process follows a pattern. A few become iconic or get drafted into the zoo circuit. But the vast majority are quickly forgotten by all but dedicated scientists—and face endangerment or extinction. The excitement that greets new species simply doesn’t translate into enthusiasm for their preservation. Today we’re living in the golden age of animal discovering, finding more new species than at any other point in modern history. Advanced technology has allowed us to infiltrate deeper into dense terrain than ever before, uncovering 1,200 new species in the overgrown jungles of the Amazon alone. Meanwhile, DNA testing has proved that there’s more species variety than the naked eye can detect, as the olinguito’s surprising emergence proves. At the same time that we’re discovering so many new animals, though, we’re killing them off faster than we ever have before. Climate change, environmental destruction, and pollution are bringing more and more species to the brink. Almost 5,200 animals are officially endangered, up from around 1,900 in 1998. And our obsession with hunting down already-dead animals and cloning others distracts us from the more pressing needs of still-extant threatened species. Humans, in fact, have become oddly selective in choosing animals to save. Pandas are almost universally treasured. But Looney Tunes scamp aside, the world has showed little love for the Tasmanian devil, a rodentlike marsupial that is being rapidly killed off by a facial tumor disease. Scientists are horrified by the sudden and somewhat mysterious onset of mass death, and the word extinction is already being tossed around. To compound matters, the Australian government just approved a mine that may annihilate the last remaining population of tumor-free devils. Even as the Tasmanian devil slides into eradication, it continues to vie for attention with the Tasmanian tiger, an extinct species that found unlikely posthumous fame. The tiger, or thylacine, was incorrectly believed to be preying on settlers’ livestock in the early 20th century, and by the 1930s bounty hunters paid by farmers had killed most of the animals. The last thylacine died in 1936 after spending its final years scurrying back and forth across a small zoo cage. A strange cult, however, developed around the thylacine soon after, and over the last eight decades, there have been 3,800 unconfirmed sightings of the animal. In death, unlike in life, the thylacine is good business: In 1983 Ted Turner offered a $100,000 reward for evidence of a live thylacine, and the Bulletin, an Australian news magazine, raised the prize to 1.25 million Australian dollars. Humans have spent the last 80 years ruing their complicity in allowing the Tasmanian tiger to go extinct. Now its slightly grotesque sister species is facing catastrophe—and there just isn’t any sympathy for the devil. Meanwhile, on mainland Australia, another, weirder drama of species discovery is playing out, one that may indicate the darker side of species discovery: species fraud. Last June an Australian naturalist named John Young claimed to have captured the night parrot on film for the first time in history. The parrot, though not officially extinct, is so rare and elusive that scientists have questioned its continued survival. And there might still be reason for doubt: In 2006 Young alleged to have discovered an entirely new bird species, the blue-fronted fig parrot, but his findings were suspected to be manipulated. If the night parrot did re-emerge, it would be in the rare category of so-called Lazarus animals: those species rediscovered after years of purported extinction. Consider the case of the Bermuda petrel. European settlers brought domestic animals to Bermuda that obliterated the seabird’s population, and the species was considered extinct by the early 17th century. Yet a 1951 rediscovery brought the petrel back to life, and Bermuda immediately launched an intensive protection program to keep the beautiful bird alive. And it worked: Today the petrel’s population has grown exponentially, and Bermudans consider its conservation a patriotic duty. 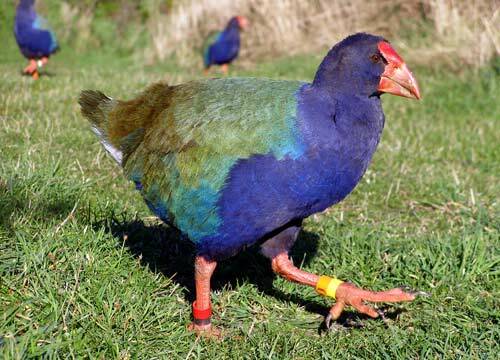 New Zealanders have taken a similar tack with their beloved takahē, turning the gorgeously colorful bird into a national symbol and throwing millions into its preservation. Not every Lazarus animal become a point of patriotic pride, of course. In the 1970s scientists stumbled across Chacoan peccaries residing in northern Argentina. The hairy, porcine beast had previously been considered long-dead. But Argentinians failed to rally around the now-endangered peccary, allowing its natural habitat to be destroyed at alarming rates. Likewise, no one is rushing to raise millions for the tree lobster, a Lazarus insect species rediscovered just last year. Once ubiquitous on a small island in the South Pacific, the tree lobster was thought to be killed off by non-endemic rats in the early 20th century. But several specimens somehow survived on an isolated volcanic fragment 13 miles away, reproducing. Perhaps the most thrilling Lazarus species to emerge is the coelacanth, a massive, deep-sea-dwelling fish thought to have gone extinct 65 million years ago. The appearance of a specimen in 1938 stunned the scientific community, providing a glimpse into aquatic-to-terrestrial evolution. Nothing less than a living dinosaur, the coelacanth launched a new era of species rediscovery. In fact, most Lazarus species tend to draw even more publicity than new species, and it’s easy to see why: If new species are good news, Lazarus animals are downright miraculous. But those miraculous discoveries don’t always translate into continued enthusiasm, as the Chacoan peccary’s plight suggests. Many factors contribute to a species’ survival, of course, but adorable animals are significantly more likely to be preserved than unsightly ones, thanks to a cult of cuteness promulgated by zoo culture. David Stokes, a professor of conservation biology at University of Washington, isn’t bothered that the publicity surrounding a new species’ debut does not often translate into continued support. For conservationists, excitement discovery can be a welcome burst of good news in “a scene heavily dominated by bad news.” We’re constantly hearing of drowning polar bears and disappearing bees; spending a day chattering about the olinguito provides a kind of vacation from the pessimism. Benign as that notion may sound, it also indicates the problem inherent to separating species discovery and species conservation. Discoveries like the olinguito are thrilling, certainly, but they’re only the start of a never-ending fight for preservation. Those hunting thylacines and night parrots aren’t of much use to the thousands of species that could go extinct in our lifetime—10,000 have already gone extinct the last 100 years—and their quest might give the false impression that extinction isn’t permanent. Uncovering Lazarus animals and new species is exciting, but the real work comes in the follow-through. And unless scientists, zoos, and governments are prepared to dramatically alter the way we think about and fund species conservation, our golden age of animal discovery could soon become an age of mass extinction. More from Slate’s series on the future of exploration: Is the ocean the real final frontier, or is manned sea exploration dead? Why are the best meteorites found in Antarctica? Can humans reproduce on interstellar journeys? Why are we still looking for Atlantis? Who will win the race to claim the melting Arctic—conservationists or profiteers? Why don’t travelers ditch Yelp and Google in favor of wandering? What can exploring Google’s Ngram Viewer teach us about history? How did a 1961 conference jump-start the serious search for extraterrestrial life? Why are liminal spaces—where urban areas meet nature—so beautiful?